Reason Four - Sworn affidavits don't prevent vote fraud. « Reason Three: HAVA ID . . . Again?! The illusion of honest elections . . . .
A young 30-ish white male walks into an early voting location and says he lost his wallet, has no photo ID, and wants to vote. He has to sign a sworn affidavit, stating his identity and his alibi, but it doesn’t matter. He’s using a fake name–a voter who moved away long ago. 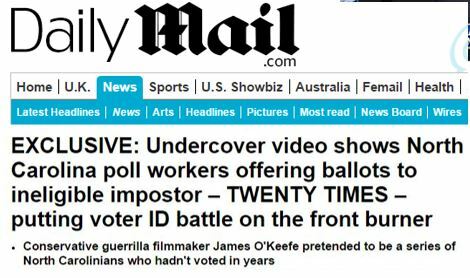 In November 2014, we helped investigative journalist, James O’Keefe, demonstrate how easily a variation of this ploy enabled one person to harvest 20 votes in less than three days of work. Had he used the entire 10-day early voting period, he easily could have stolen 70 – 100 votes. If some ACORN-type organization paid 100 people to do such work, it would be 7,000 to 10,000 votes: enough to steal a statewide election. Current North Carolina law provides no way to detect such criminal behavior while in progress, but there are some cheap and simple ways to prevent this doomsday scenario. Sadly, a sworn affidavit does neither. All a crook has to do is sign a piece of paper, swearing that they are who they say they are, “under penalty of perjury.” But, unless an acquaintance overhears the fake name, there is a 100% chance the vote will count and the illegal voter will never be caught. Wait! Didn’t Voter ID Fix This? North Carolina’s 2013 election law reforms included some preventative measures, but lawmakers appeased “disability” activists with a special loophole. Who knew that asking a curbside voter for proper ID would invite a discrimination lawsuit?!? We thought Legislators were poised to close this loophole with Senate Bill 49, but the ground shifted after reports surfaced on how DMV employees broke the law and sabotaged the “free” voter ID provisions. Then, lawmakers were forced into more loopholes, via HB 836. This bill grants anybody the right to vote without photo ID if they just sign an affidavit and either correctly recite the voter’s DOB & SSN-4 (last 4 of SSN) or (we do mean “or” . . . not “and”) produce one of several types of the non-photographic documents, (including HAVA IDs), discussed in this earlier post. We’ve already listed a bevy of badness associated with 836, which can be explored at our “fix-836” webpage. Please click here to see our growing list of objections and suggested corrections to HB 836. Today’s reason (836 needs repairs) involves the cynical soothsayers who speak reverently about sworn affidavits as if they magically prevent vote fraud. We wish that were the case, but we’re talking about a crime that’s nearly impossible to detect until long after the votes are all counted. Do the math. With enough “walk-around” money, enough fake pieces of paper and zero chance of getting caught, a sworn affidavit prevents nothing. We’re deeply concerned about fraudulent voters, “overwhelming the system” with ID theft (either by voting curbside or by claiming “reasonable impediment”) in order to steal an election; so we offer a few security measures to prevent enterprise-level vote fraud without harming honest voters. While we’re still not convinced that “hundreds of thousands of voters” cannot obtain a free ID card, attaching some sort of DNA or biometric identifier to their affidavit would greatly discourage fraud. For example, Mexican elections require a thumb print. (Sigh) Maybe we can raise US standards up to Mexico’s one day. Disney uses a photograph and some facial recognition software. Banks use an invisible ink print of the customer’s forefinger. Our perhaps DMV could pay penance by incorporating their photos into the BOE’s poll books. None of these measures are very costly or invasive, but any of them would help. Oh, and they would need to be mandated by law. The overarching principle is to put people on notice: If they steal votes, they might get caught. Of course, a few prosecutions would also help advance this crazy notion . . . but that’s another story.